Six artists represented by Art/Space Virginia Miller Galleries recently received major recognition, including first prizes in international competitions and representation in museum exhibitions. Irene Pressner, an emerging artist from Venezuela whose encaustic works done with ink applied with a tattoo needle were included in the gallery’s last exhibition, topped a field of 132 top Latin American artists last month to win the $50,000 first prize and inclusion in the permanent collection of the Museum of Latin American Art in Long Beach, California. Pressner’s winning work was one of her “Rococomics” series, a 28-inch-square encaustic work similar to those presently being exhibited in our annex gallery. The series incorporates well-known cartoon characters, like Dennis the Menace and Woody Woodpecker, into elegant floral patterns so perfectly that they are not apparent at first glance. Closer scrutiny causes the shock of recognizing well-known comic characters in their incongruous settings. Sergio Garval of Mexico, whose apocalyptic visions are the subject of paintings on the gallery web site, was awarded the first prize of $50,000 at the Rafael Cauduro First Biennial of Drawings Competition of the Americas held in Tijuana, Mexico, in September. The Santa Monica exhibit is a smaller version of the original exhibition at the Museum of Contemporary Art, San Diego. 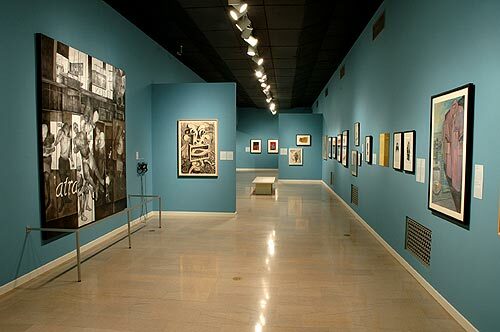 Another 2006 museum exhibition, “Paper Traces: Latin American Prints and Drawings from the Collection of the San Diego Museum of Art,” included Crosthwaite’s eight-foot drawing, “Bartolome,” acquired from the gallery’s exhibition. Josephine Haden‘s work was featured in “New American Paintings,” juried by Alex Baker, Curator of Contemporary Art at the Pennsylvania Academy of the Fine Arts. Earlier last year, five of her paintings on wood were featured in the new Russian Esquire magazine. Soledad Salamé, whose photographs and paintings were introduced by the gallery at the Bridge Art Fair during Art Basel, presently is having a one-person exhibition at the Museo Histórico y Arqueologico in La Serena, Chile, her native country. The exhibition, which originated at the Museo Nacional de Bellas Artes in Santiago, will travel in March to the Pinacoteca at the University of Concepción. The Joan Mitchell Foundation recently notified sculptor Melquiades Rosario Sastre of Puerto Rico that he was one of 25 artists to be awarded $25,000 grants “to acknowledge painters and sculptors creating works of exceptional quality.” Melquiades, who uses only his first name, was represented with three works in the gallery’s last exhibition.